This will be a short series of posts to do a brain dump on what I found. This introduction will provide a few definitions and some plausibility arguments for why you might care. 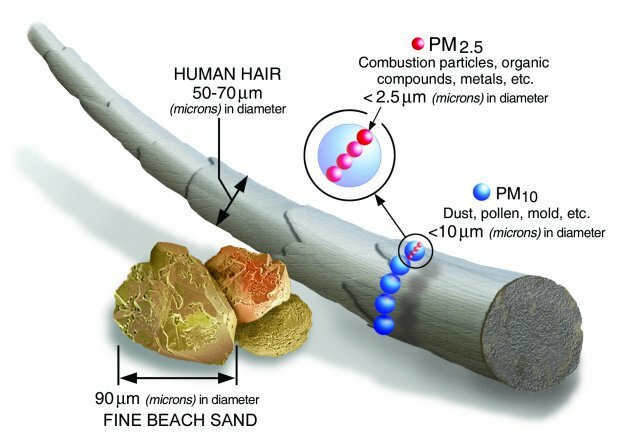 “Air quality” can mean a lot of things, but when talking about fires the main concern is particulates (unless you are standing so close that you are inhaling the burning plastics, in which case you have bigger problems). Your body reacts to them by making you cough, sneeze, etc. This is your body’s way of trapping and expelling these particles before they reach your lungs. Your body reacts to them by making you cough, sneeze, etc. This makes you aware that something is wrong and encourages you to be somewhere else. In short, we evolved to handle particles on this scale; our ancestors had hay fever, too. We did not evolve to handle the output of an internal combustion engine. Between 2.5 and 10 microns, particles are called “coarse”, and they make their way into your lungs. Between 0.3 and 2.5 microns, they are called “fine”, and they pass through your lungs and into your bloodstream. Below 0.3 microns are the “ultrafine” particles that get everywhere, including your brain. None of these are perceptible. When you vacuum your carpet, for instance, you capture most of the larger make-you-sneeze particles. But the smaller ones pass through the vacuum’s filter and bag like they are not even there. All your vacuum does to fine and ultrafine particles is stir them up… And you cannot even tell. Those little paper masks do nothing. Same for the filter in your HVAC system, probably. And yes, tiny particles are bad for you, especially in the long run. Long-term effects are always tricky to prove, but the evidence of nasty connections (e.g. between ultrafine particles and dementia) seems to grow every year. OK, that will do for an introduction. The remaining parts will be about how particulates are measured, how you can measure them yourself, and what you can do about it.